The 2GIG-CP21-345 is a fully self contained, color touch screen panel contains an optional snap-in cell Radio, a 24-hour backup battery, and allows 32 user codes to monitor up to 48 zones and 2 hardwired zones. Add up to 4 additional keypads and 8 keyfobs without taking up a zone. Every peripheral product that 2GIG manufactures communicates seamlessly with the 2GIG-CP21-345 control panel. All of the peripheral sensors sold by 2GIG know what type of sensor they are, making the installation faster than ever. Communication is instantaneous when programming in peripheral sensors to the control panel, so don't waste your time. No longer is home automation only available for the elite. 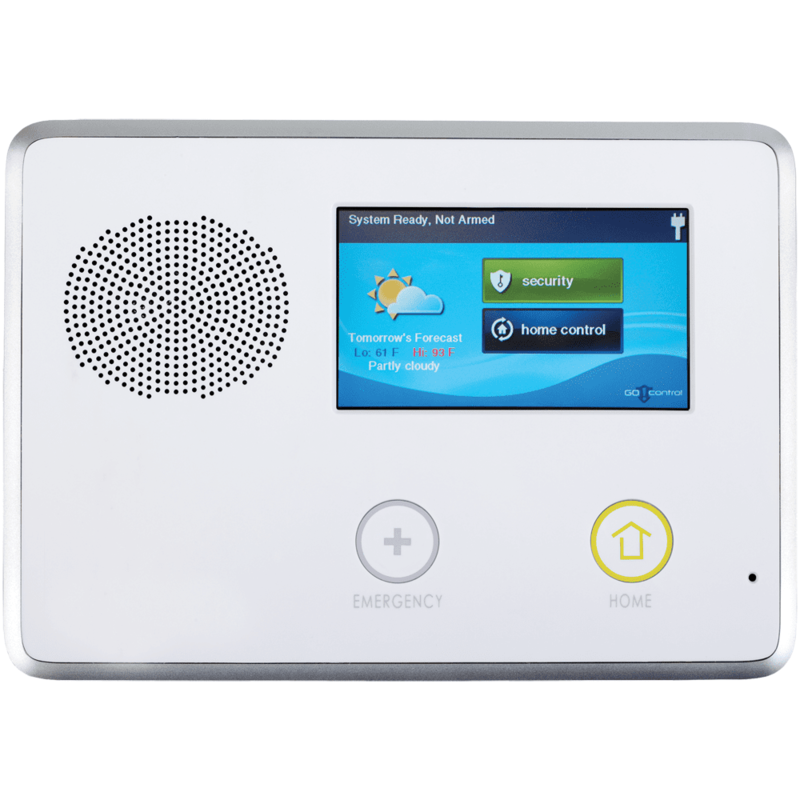 The 2GIG-CP21-345 panel makes it easy to control hundreds of different Z-Wave devices around the property via the control panel or remotely through your Alarm.com interactive app. Full Voice Response: The panel gives clear notifications that indicate system status, zone descriptions, alarms, and emergencies. Date, Time & Weather Display*: The panel scrolls through date, time, and real-time weather forecasts. Provides severe weather alerts in the event of a tornado, tsunami, or wildfire. Quick Access: One touch access allows the quickest help possible in an emergency. The panel's LED buttons indicate the system's status. Multiple Arming Options: Secure your home by arming your system "AWAY" or "STAY". The Quick Arm/Exit and Bypass features offer added convenience. Home Automation Radio Module: The built in Z‐Wave radio enables various home automation functions including HVAC, locks, water flow, appliances, garage door, plus lighting control. Two-Way Response over Cellular or POTS: Two-way voices lets GEOARM central station operators listen in and talk to you when a signal is received, ensuring that the proper emergency response personnel will be dispatched if necessary. Over‐The‐Air (OTA) Updates: There's no need to worry about the panel's software becoming outdated. With the OTA function, the panel can be remotely updated with the latest software. Future-Proof: There's no need to worry about your panel's software getting outdated. With our Over-the-Air function, your panel can be updated with the latest software via cellular radio or update cable. Remote Control Options*: Always be in control remotely, managing your system from a computer or an iOS, Android, Windows, Blackberry smartphone or tablet. Intuitive LCD Touch Screen: The easy-to-use color touch screen puts a wide range of security and home automation controls at your fingertips. Takeovers: Running into pre-existing systems? Our optional snap-in dual receiver allows you to take over most existing 319 MHz devices. Hardware takeovers are just as easy using our Takeover Module. Panel Dimensions (H x W x D): 6" x 8.5" x 1.4" in. Touch Screen Dimensions: 3.75" x 2.25" in.